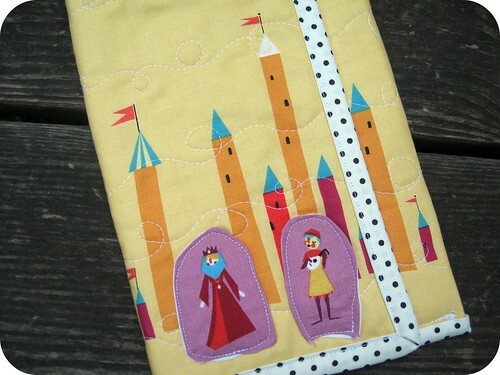 I am not sure that I've adequately gushed about Lizzy House's new line Castle Peeps here on the ol' blog yet. It's just so much F-U-N to work with. No matter what it is that you're making, this line really brings it to life. Which is precisely why it was the perfect choice for this next project. Let me go back for a minute to my time at quilt market. I met so many amazing people, one of the most amazing being Beth Dunn (who blogs at An Accomplished Young Lady). Beth is one of those rare, warm people who immediately upon meeting you feel as if you've known for a long time. In short, Beth Dunn = awesome. I had a great time getting to know her and subsequently keeping in touch via Twitter. Beth celebrated a birthday recently and decided to treat herself to a Kindle. I immediately offered to make her a handmade Kindle holder because ... well, because I just really enjoy giving people gifts! And I've made a few Kindle holders before from the amazing Moda Bake Shop tutorial (see here, here, here and here). Because Beth is a true Renaissance woman (like, literally) , a card-carrying member of Team Bronte, and a lover of all things Victorian, I thought a little bit of medieval fabric would be a nice choice to wrap her Kindle in with love. Enter Castle Peeps. I let my creativity run a little bit wild with this one, and fussy cut some of the peeps to sew against a backdrop of castle towers. I used the spear & shield print for the lining and bound it in a black & white polka dot fabric (still not 100% about that choice, but I think it turned out OK). 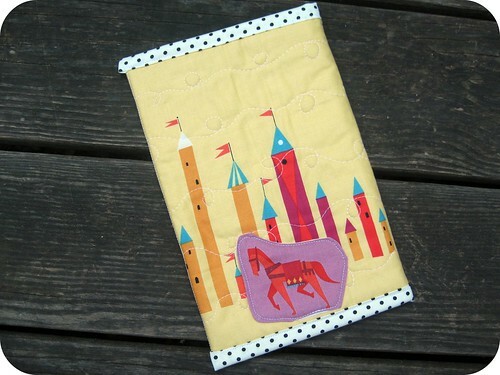 Here's a little surprise on the back of the holder: a prancing horse! I can blog about this now because Beth received it this week, and you can read more about it on her blog here. I'm so glad you like it, Beth! I hope you get lots of good use out of it. I used some of my favorite Joel Dewberry fabrics in an effort to make it more of a masculine design. 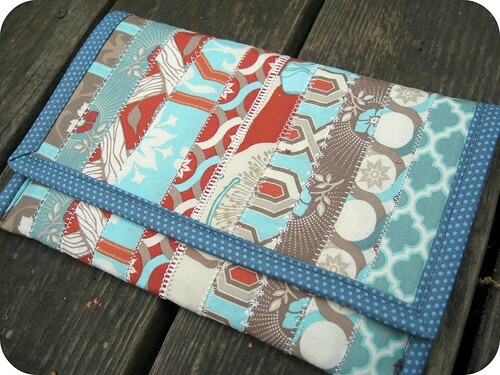 If you or a loved one have a Kindle, I couldn't recommend this pattern enough. It comes together quickly and is a lot of fun to make. I love them both, especially the castle peeps! it's fantastic John! I use my kindle holder all the time (obviously, my kindle lives in it) and I LOVE LOVE LOVE it! 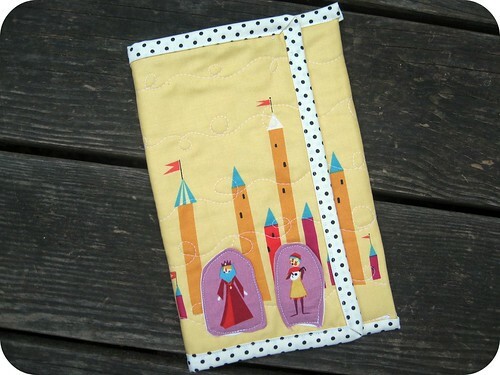 I am still swooning every evening over my Castle Peeps Kindle case. And the prancing horse is my favorite part! Although I'm pretty fond of the little singing dude on the front, too. I love these! Thank you for sharing the link for the pattern. What a neat gift John! 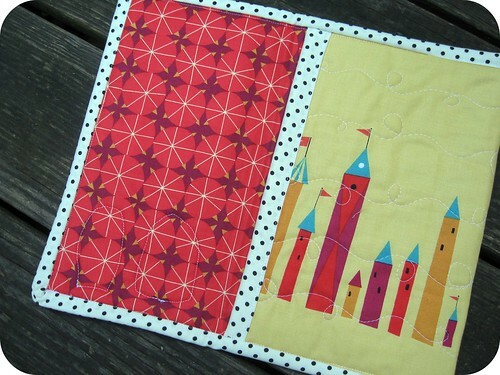 I think the polka dot binding was a great choice. It really sets the whole thing off. Great gift idea! Now if I only knew how to make one! I love books & really haven't warmed to the idea of a Kindle. But having that nifty Castle Peeps carrier to put one in could turn the tide for me! I love the Castle Peeps case! What a thoughtful gift. I'm lusting after castle peeps in the orange colors right now. 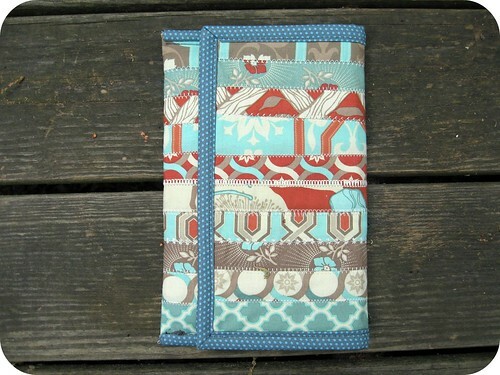 Love the Kindle case! John, you are my savior! I love it to pieces!!! I had been looking for a colorful cover for my kindle (My hubby was sweet and bought me the leather cover with my Kindle) but sometimes you need a little color in life. You are awesome, now I think I have the perfect fabric hiding in my stash! Those are so fun, John. My castle peeps FQ collection arrived while I was on holiday - I can't take my eyes (and hands!) off of it!! Oh man, I just got a nook! It absolutely needs a castle peeps cover JUST LIKE THAT ONE!